*NOTE: If possible, it is always best for a human baby of any age - and especially for a preemie - to receive his/her mother's milk, or human milk from another mother (not just a human milk fortifier). 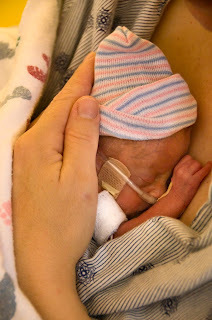 It would be best to give preemie babies their (pumped) mother's milk if they are unable to nurse - or donated milk from another lactating human mother. Still, the human milk fortifier made from human milk is much better than the more commonly used bovine-based milk fortifier. For more on donating your milk (to use as WHOLE human milk for babies in need) or for accepting donations, please see the mother-t0-mother sites on this link. Prolacta Bioscience, the first and only company to offer human milk fortifier (HMF) made from 100% human breast milk for premature and critically ill infants, has announced the results of a groundbreaking study that will have long-term benefits for the nutritional care of very low-birth-weight preterm infants (less than 2 pounds, 12 ounces or 1250 grams) in the neonatal intensive care unit (NICU). The study was published in The Journal of Pediatrics December 28, 2009 online edition at www.jpeds.com. The landmark study, whose lead author was Sandra Sullivan M.D. with the department of pediatrics at the University of Florida, Gainesville, concludes that for very low-birth-weight preterm infants weighing less than 1250 grams, an exclusively human milk-based diet is associated with significantly lower rates of necrotizing enterocolitis (NEC) and surgical NEC, when compared to a very low-birth-weight preterm infant who received a diet that includes bovine milk-based products. NEC is a severe complication that often affects preterm infants, in which the intestinal tissue disintegrates. It is a serious disease with a mortality rate approaching 25%1. The results of the study are significant because, until recently, the standard of care and the only human milk fortifiers available were bovine-based (cow's milk). This posed challenges for the nutritional care of very low-birth-weight preterm infants in the NICU because of the occurrence of intolerance to feedings, possibly as a result of exposure to non-human protein in the bovine-based fortifier. The trial was comprised of three study groups of infants whose birth weights ranged between 500 and 1250 grams. Groups one and two began fortification at different times. These first two groups of infants received pasteurized donor human milk-based HMF, Prolact+ H2MFTM from Prolacta Bioscience. The third group received the standard feeding protocol of bovine milk-based HMF, and preterm formula if mother’s own milk was not available. The most significant difference among the three study groups was the incidence of NEC, which was approximately two-thirds lower in the two study groups using the human milk-based HMF, compared to the study group using bovine milk-based HMF. Prolact+ H2MF is the first and only commercially available human milk fortifier made from 100% human breast milk. The current standard practice in the NICU uses bovine milk-based products for human milk fortification. A recent study has demonstrated that for very low-birth-weight preterm infants in the NICU, human breast milk decreases the incidence of diseases such as necrotizing enterocolitis (NEC), bronchopulmonary dysplasia (BPD), and sepsis2. NEC is a devastating disease of the gut and a leading cause of premature infant death3. Prematurity has been escalating steadily over the past two decades, and one out of eight babies is born prematurely in the U.S.4 Of that category, about 10% of these births are very low-birth-weight preterm infants. Most babies who use Prolacta products are born weighing less than 1250 grams. These infants are considered very low birth weight, and are at substantial risk of serious health problems, lasting disabilities, and even death5. Prolacta’s products are formulated to meet specific criteria as prescribed by neonatologists. Therefore, Prolacta standardizes their products with precise calories, nutrients, and proteins to meet these criteria. Prolacta Bioscience, Inc. (www.prolacta.com) is a life science company dedicated to improving quality of life by Advancing the Science of Human MilkTM. Prolacta creates specialty formulations made exclusively from human milk for the nutritional needs of critically ill premature infants in Neonatal Intensive Care Units. It is the first and only company to provide a human milk fortifier made from 100% human milk, Prolact+ H2MFTM. They operate a pharmaceutical grade processing plant and have designed and patented processes that enable them to make their one-of-a-kind life saving products. Prolacta is committed to making a meaningful difference in the lives of the most vulnerable infants through world class research and innovative products. 1) Medline Plus. (2009, May 15). U.S. National Library of Medicine and National Institutes of Health website: http://www.nlm.nih.gov/medlineplus/ency/article/001148.html. Accessed December 26, 2009. 2) Meinzen-Derr J, Poindexter B, Wrage et al. Role of human milk in extremely low birth weight infants’ risk of necrotizing enterocolitis or death. Journal of Perinatology 2009 Jan;29(1):57-62. 3) Spitzer A. Intensive Care of the Fetus and Neonate. 1996. 4) March of Dimes. http://www.marchofdimes.com/prematuritybb/21191. Accessed December 26, 2009. 5) Laffan EE, McNamara PJ, Amaral et al. Review of interventional procedures in the very low birth-weight infant (<1.5 kg): complications, lessons learned and current practice. Pediatric Radiology. 2009 Aug;39(8):781-90. I feel it is important to have all the facts on hand before wildly singing the praises of Prolacta (as the original article does - how many times can you count the word "life-saving" associated with the Prolacta product?). What everyone reading needs to understand (and what they may not) is that Prolacta is a for-profit company, which solicits donor milk from altruistic women (who are UNPAID for the milk they hand over - they do not get a single cent), and that Prolacta creates its "life-saving product" from the ORIGINAL life-saving product -- the breastmilk of these generous donor mothers! Also worthy of note is the exorbitant cost of Prolacta's product. This is born by the hospitals AND by the parents fighting to save the lives of their babies in the NICU (or their insurance company may bear some of the costs, if they are very lucky). Does a family having to bear an approximate $10,000 cost for Prolacta's Human Milk Fortifier used for their baby during their NICU stay sound right to you? And what is their "human milk fortifier," exactly? How is it processed? How do they manipulate the caloric value of the donor milk to "suit very low birth weight babies"? Some transparency, some justification of this high price to pay, is needed. Furthermore, is there any evidence available showing that VLBW babies fare worse if given their mother's breastmilk, ALONE? I.e. do we know that fortifier, of any kind, is truly necessary? This is one of these examples of putting the cart before the horse; the medical establishment just assumed that fortifier was needed for these tiny babies, not realizing that NEC could, perhaps, be far better kept at bay if these babies were exclusively fed their mother's milk (with no additional HMF), and that these babies could, indeed, grow and thrive on mother's milk alone. Did anyone verify that first? This study is flawed, in that it should be comparing the babies being fed breastmilk + HMF to babies being fed *strictly breastmilk*. Comparing babies fed human milk + HMF to babies fed human milk + bovine-based fortifier is not a useful comparison. We forget that we must always compare the intervention (in this case, the addition of HMF) to the baseline (which is very low birth weight babies receiving strictly their mother's breastmilk). Yes, we are "saving" tiny babies earlier and earlier with the advance of technology, but there is evidence to show that the milk of mothers who give birth to premature babies is different, and already perfectly suited to the needs of their tiny baby, born too soon. I beseech the medical community to explore this first, before unconditionally endorsing the Prolacta product, before touting it as "life-saving" at every turn. I also ask that any woman considering donating her breastmilk to Prolacta look into this company (and its ethics) very, very closely prior to doing so. End Note: There are likely mothers in your area, those who you could be connected up with by local midwives or lactation consultants or doulas, who would put your extra breastmilk to GOOD use. Ask around before shipping to a far-off location. And be sure to check out mother-to-mother donation programs as well. Thank you for this post. I know someone who's sister has a preemie who could benefit from this. Great information. Most preemies do NOT need any human milk fortifier. They do not need more protein, calcium, etc. While (formula company) studies show faster growth with fortifiers, studies also show far greater intestinal infections and inflammatory disorders (NEC), respiratory infections, longer hospitalizations, lower IQ's and lower survival rates when any non-human products are used, making the size thing rather a moot point. I have 10 pages of text on feeding preemies, with 4 charts summarizing 17 studies that compare various human and non-human feeding attempts. Except in terms of growth rate, exclusive breastmilk always comes out better. Again on that size thing, studies on adults show that rapid growth spurts during infancy predispose to diabetes and cancers. There is no evidence to support any benefit of speeding up growth rates in term or preemie babies or in children (or adults). I do think if fortifier is given it should be human milk based but for prolacta to charge such outrageous amounts does a lot of harm by keeping that product from babies who would benefit which is not the donation mother's intention. My last baby born at 31 weeks developed NEC while in the NICU and never recieved any formula just my pumped milk. I blame the fortifier in part for his NEC. I wish they has used a human milk based one instead of a cow's milk but as many NICU moms know they don't give you many choices in the NICU. If it had been up to me he would not have had fortifier at all. Thankfully he pulled through but maybe he would not have to been through such an ordeal if prolacta were not so greedy with their product.